So-called modern companies count on a highly active and professional HR, with very well crafted Individual Development Plans (IDP’s), well-designed succession strategies and elaborate annual evaluations. But these policies and restrictions stifle the system and in the end, the HR becomes inefficient. One of the main principles of the Agile Manifesto focuses on individuals and their interactions. In other words, we must look beyond the individual, taking into consideration the environment and the other people who influence, help and build products. This is why focusing on self-manageable and self-motivated teams, rather than exclusively on individuals, becomes the first step in achieving a culture of managing high-performance teams. To better understand and explain the focus the HR should have in seeking efficient and effective teams, we’ve drawn up the High-Performance Teams Spiral. The first step in achieving teams with these characteristics breaks through precisely some of the paradigms within HR. We should change our focus from the individual and turn to the team. But we’ll take a look at that up ahead, in a new post about Agile HR. Agile is a culture which deals with constant deliveries of high value in short cycles, based on collaborative work. So the first step is to organize the team so it starts delivering constantly. We make the mistake of planning everything so we’re sure of having the perfect project, with each detail exhaustively planned. We imagine an ideal, do all the specifications, all the designs which will theoretically mitigate the risks and then, after a year, we deliver something which, for various reasons (politics, economics, culture, competition) has lost all relevance, importance, and even value. That is why we must slice the problem we’re trying to resolve and deliver short and frequent slices, thus creating a rhythm for value delivery. Culturally we’re tied to daily tasks. We’ve always got a lot to do and we’re usually so busy that there’s no available time, people or resources. Demand will always surmount our capacity to deliver. This is why we must always prioritize our list of tasks according to business value. If it happens that a new idea or necessity appears on the list, ask whether it’s fundamental to the project’s success. If the answer is no, then simply discard it. With constant deliveries in short cycles and prioritized according to value, the leader (Coordinator, Manager, Director, VP, etc.) will be able to present, in short, regular cycles, the product’s successive increments to the client, users, leaders etc., and get feedback. So he’ll definitely be closer to the team. For the company, delivering something truly tangible is far more relevant than presenting a usually untrue evolution of a product, along with the percentage of readiness and the likelihood of it being finished on time. It’s extremely important not to confuse this proximity with micromanagement of the team. In fact, this proximity also occurs through the short feedback cycles, because as well as doing frequent value deliveries, the team does continuous improvement of both the product and its own work process. A team which delivers continuously high value, with a leader nearby playing the role of facilitator, understanding the value for the company strategy of its work and collaboration, really enjoys what it does. The team’s motivation, energy, and purpose will empower it and strengthen its decisions. This team will automatically be imbued by a spirit of such great energy that it will start to behave like a company owner. It empowers itself and consequently acts like a company director. This brings the team autonomy and responsibility and this feeling will automatically result in rejecting ideas in favor of continuous improvement. Teams which achieve success have a problem, which is a drop in yield. This happens because the team settles down and stops evolving. Agile teams should be the opposite, never satisfied and always seeking improvement at every turn. Teams should carry out continuous improvement at all times. High-performance teams achieve greater levels of creativity, innovation, and commitment, learning to establish relationships based on trust between its member and leadership. Generally, when this doesn’t occur, people have the tendency to hold back their ideas and consequently kill that well-known and priceless element: pro-activity. Relationships with a high degree of trust generate collaboration, commitment and the spontaneous interactions necessary for achieving excellence. When team members don’t have a strong relationship with each other, they don’t develop deep levels of trust and in the end, don’t take the risks necessary for accelerating everyday performance. When the spiral starts to turn upwards, both the team and the individual form an amazing thirst for knowledge. We’re talking about what truly makes you happy, increase your will to learn and face new challenges. After all, this is the age of knowledge! And the spiral continues its upward centripetal force, increasing the motivation of the team and its members. The best teams we know are surrounded by intrinsic motivations and protect themselves from any external factors pulling them in a different direction. Extrinsic motivation is influenced by external factors such as money, power, pressure, image etc. Intrinsic motivation, as Daniel Pink points out, is what gets you up in the morning, ready for a busy day’s work. And I don’t mean your alarm clock. 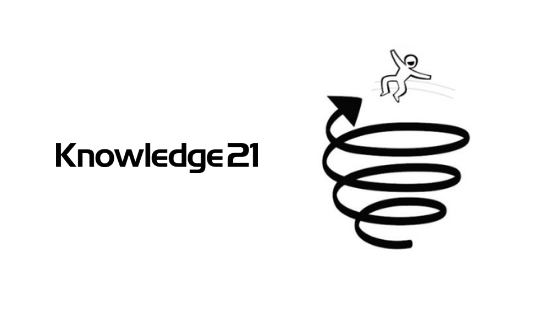 In the age of knowledge, losing a member of the team means that a piece of knowledge has been lost too. A team with low turnover, as an initial consequence of constant value deliveries in short cycles, takes on a series of commitments and actions which are the basis for a high-performance team. Maturity results in elements such as the team’s motivation and engagement in the organization’s daily and overall objectives. This dimension reflects directly on the team’s trust and performance. It also contributes to the team assuming responsibilities and being comfortable about itself. High-performance teams have a strong competitive advantage, since they adapt to changes more easily, and create intelligent solutions for new challenges. The great majority of texts and studies about high-performance teams concentrate on the role of the Leader, how he or she should manage and build this team. Although that role is an important one, we believe that one must also focus on the team members and how to bring them closer to their leaders. We can see that the path to achieving the long-dreamed-of high-performance team passes through a profound cultural change. We’re talking about the adoption of Agile culture in its broadest sense. 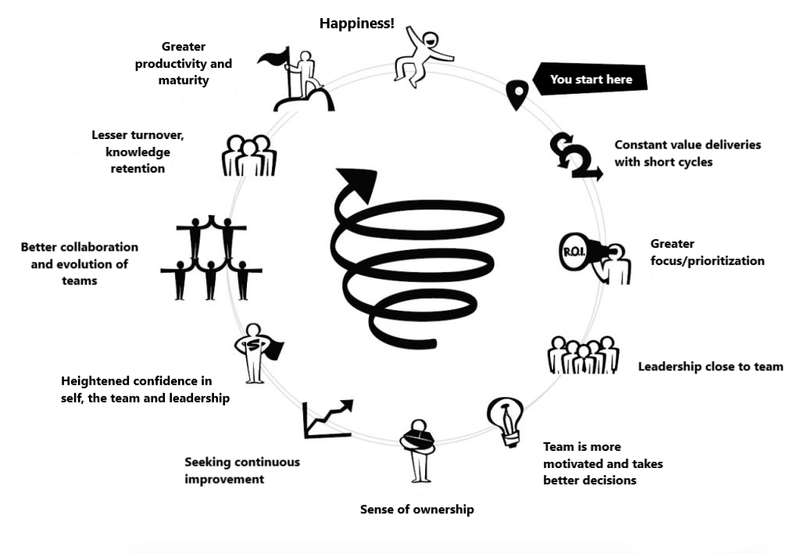 To enter and evolve in the Spiral of High-Performance Teams, teams can and should organize themselves and seek continuous improvement, maintaining value delivery and happiness as their main priorities. Learn more at our upcoming Management 3.0 training. « Toxic Metrics: What can kill Agility in your team?